Cheers to Venkadesh! This year he did it! Congratulations to our Bar Manager, Venkadesh! He just won the title of “Sake Sommelier of the Year” in the international sake sommelier competition in London. Regular readers of our blog may remember that last year, Venkadesh came second (read more about it here), so we’re extra delighted that this year, he managed to take the top spot. Next time you’re at the Bonnington, pop into Healey’s Bar and try one of his sake creations! Healey’s is shortlisted and booking.com loves us! 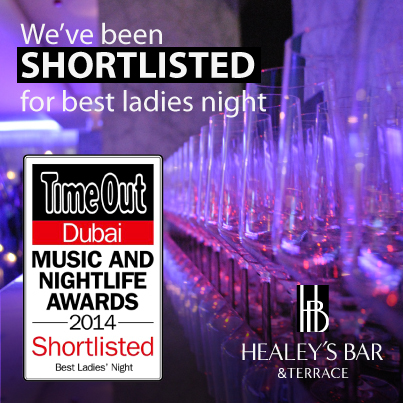 We’re very pleased that our Healey’s Bar & Terrace has been has been shortlisted for “Best Ladies Night” in the fifth annual Time Out Dubai #nightlifeawards! Our team will attend the award’s ceremony on February 26th and we wish them the best of luck!